A few years back, I met this lovely woman, Xaviera. She spotted a friend of mine wearing a Pio nameplate necklace at a concert and asked where she'd gotten it; my friend pointed to me; she was delighted by the idea of having her unusual name made into a nameplate. Soon after, we met and she placed an order. I snapped this sweet photo of her wearing it at to my beloved nearby coffee shop a few weeks later when I'd finished it. Cut to 2 1/2 years later. Having dreamed about going to see the only naturally occuring lake in the state of Texas -- Caddo Lake(where Texas and Louisiana meet) -- since I first heard about it a few years back, I finally planned that trip. I was hiking through Caddo Lake State Park this past Saturday with a couple of friends, when this woman appeared and kindly offered to snap a photo of us. We took her up on it; a bit later she overheard us speaking Spanish and she asked where we were from. She and my friend Lizette hugged upon learning they're both from Laredo. Something about her seemed familiar. She began to tell us that she used to live in Austin but had moved to Dallas after getting married, since her husband had been transferred for work; I knew right away who that woman was in front of me -- the very same Xaviera, proud owner of a Pio necklace, whom I'd met at that show!!! 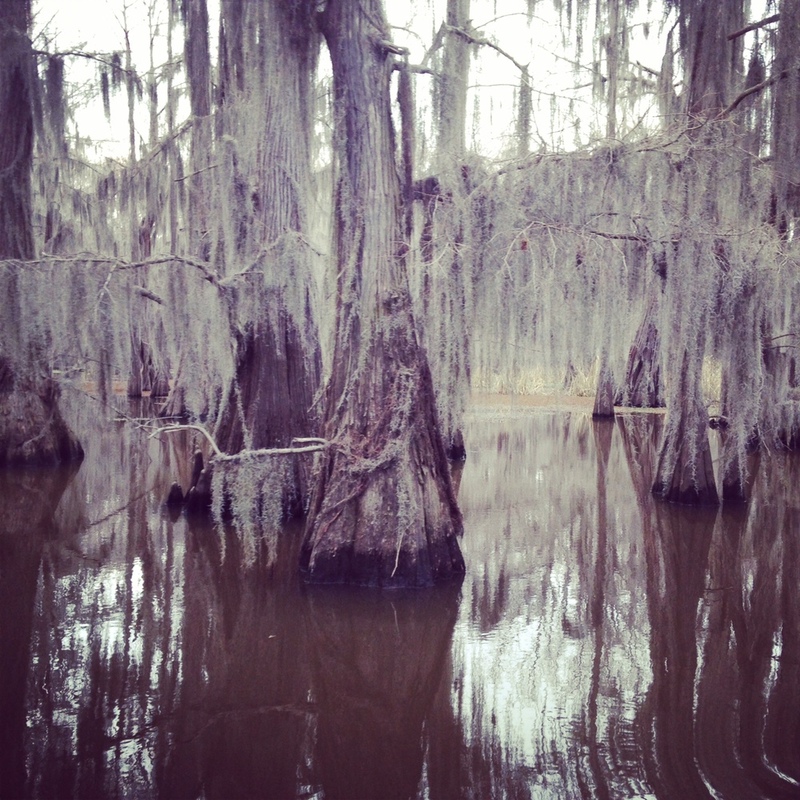 Haven't been to Caddo Lake and also thinking about a trip? If you're into camping that seems to be the way to go - plenty available right in the State Park. If not, there are cabins in the park as well, or you can stay in Uncertain, Texas as I did (at a place called Hodge Podge which was OK -- kitschily decorated cabins, which smelled a bit of stagnant air...) If you plan ahead/reserve enough in advance, you might be lucky enough to stay in a 'shipwreck' cabin! Staying in Uncertain seemed like the right thing to do for me ;) -- but there's another town nearby (which is more of a town - with a few restaurants, antique shops, a general store and even a brewery in the works) called Jefferson. There's a lovely steamboat that sometimes takes visitors on tours of the lake and leaves from Big Pines Lodge in Karnack, Texas. We didn't get to go on it because apparently it wasn't quite high season, so all the prep that goes into getting a steamboat going (i.e. making steam) hadn't happened. I was disappointed not to meet the original captain of the steamboat, Lexie Palmore, who apparently now lives and paints in Colorado. She seems like the ultimate chingona. She was so interested in boats that she worked as a maid on the Delta Queen in Mississippi, but endlessly questioned the crew, and eventually asked to steer the boat, and her wish was granted; several years later, got her pilot's license, had her own steamboat built, the Graceful Ghost, and began taking people on trips around Caddo Lake. The guy who took us on our tour was quirky, talkative, and full of interesting trivia about the region. One of these: I learned that the Caddo Indians' word for 'friend' is táysha, pronounced "Te-has,' and thus the lone state got its name. The thing to eat here is apparently catfish, and the place our riverboat guide steered us to River Bend, was rather unappealing. Overfried filets of catfish didn't seem so fresh... 'jalapeño' hush puppies had little flavor. We wished we'd stuck with our original plan to eat at Big Pines which smelled fantastic. In Jefferson, which really sits right on the border of Texas and Louisiana,(apparently they host quite a Mardi Gras, at least by Texas standards) you'll find some Cajun influences in the food -- po' boys, remoulade on everything. etoufee, etc. As far as what season to go in - everything was quite gray in mid-March now, and was gorgeous - but apparently later in spring things get greener, and as summer approaches, one can enjoy the firefly show on the lake after sundown. a pio chair was born!